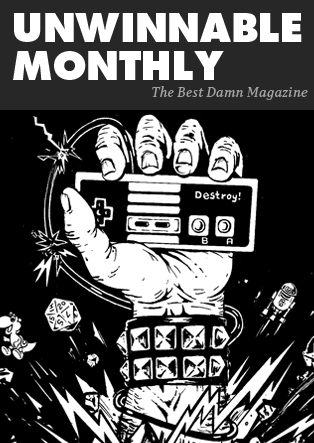 This is a reprint of the Letter from the Editor from Unwinnable Monthly #106. If you like what you see, grab the magazine for less than ten dollars, or subscribe and get all future magazines for half price. Welcome to our August issue, perfect for wiling away the dog days of summer. Jorge Gonzalez’s dramatic cover, with its wintery mood, should take the edge of the blazing heat and get you ready for our cover feature, by Rowan Evans. 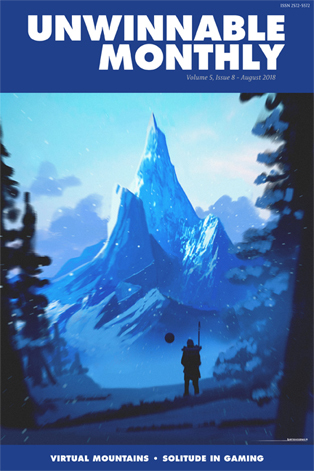 It is an exploration of mountains, as portrayed in videogames, and the various metaphors they can convey. There is much more to climbing a mountain than simply reaching the peak. The second feature sees Gavin Craig join David Wolinsky in a series of letters discussing solitude in videogames and how, no matter how alone you may feel inside a game, you’re always accompanied by the people who made it. A few of our regular columnists are on holiday, but I would like to take a moment to welcome Ben Sailer to the group. He’s written for us in the past (most recently a feature on the SNES port of Doom a couple months back) and we’re thrilled to add Collision Detection to our roster. In the coming months, Ben will be exploring the threshold where real life meets videogames – his first installment tackles (sorry, pun) the unfortunate way sports fans see some players (you know, real human beings) as disposable, much the same way as some roleplaying games prime you for acceptable losses on the battlefield. Deirdre Coyle, in a happy synchronicity with our second feature, discusses the joys being alone. Gavin Craig has a gentle rebuttal for the main essay in our most recent issue of Exploits, arguing the distinction between culture and canon. Rob Rich argues that complaining about Hasbro’s stewardship of the Transformers toy line is ridiculous. Megan Condis questions the need for a documentary about Rachel Dolezal. Astrid Budgor presents another selection of new metal albums to take the edge of summer. I filed a sneak preview of the next update of my guide to recent, lesser-known horror films. Corey Milne laments sleeping on Pyre for so long. Matt Marrone files his annual report from the Newport Folk Festival. Yussef Cole attends the Overwatch Grand Finale. Finally, Adam Boffa rounds things out with a lighthearted look at Princess Mononoke and what it says about our looming climate change disaster (just kidding, it isn’t lighthearted at all). Before I go, I’d like to mention that, spinning out of my Vintage RPG Instagram project, the Vintage RPG Podcast is now three episodes in, with a fourth dropping on Monday. Join me and my co-host John “Hambone” McGuire as we pick our way through the art and history of tabletop roleplaying games. That’s it for now. We’ll see you on the first with a new issue of Exploits. Enjoy the rest of your summer!